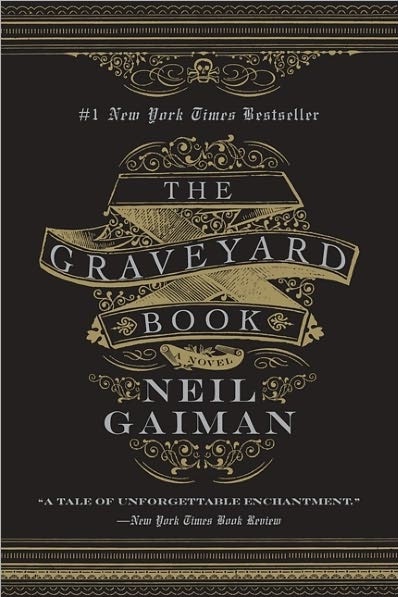 The Graveyard Book is a wistful, witty, and deliciously creepy offering from the master storyteller, Neil Gaiman. It reads like a children’s book tailor-made for adults. Opening with arguably one of the best first lines in fiction—“There was a hand in the darkness, and it held a knife.”—The Graveyard Book reels you in with its macabre start and keeps you hooked until its bittersweet end. Unlike a standard horror story, which starts out with a steady beat and builds its way to a staggering crescendo, this witty and whimsical treat from Gaiman starts at the scariest point of the piece. This book starts with bloody murder. A mysterious man named Jack walks up the stairs, wipes his wet knife clean, and prepares to “finish a job”. He has rid the house of a mother, a father, and an older sister. Now, there’s just one loose end that needs tying up—a wee boy, hardly a toddler. What would’ve been a gruesome and incredibly abrupt end to the story is happily stopped by the infant’s unwitting escape into the relative safeness of a nearby graveyard. Like a seasoned hunter (which he probably is), the man Jack follows the “milky scent” of his prey. He almost succeeds in slashing Gaiman’s story short, but his plans are foiled when the child mysteriously disappears—apparently after being saved by the ghostly inhabitants of the graveyard. To protect the infant from the bad man, a Victorian couple by the name of Mr. and Mrs. Owens adopts the child and whisks him to safety. They give him the strange and fitting name—Nobody, or “Bod” for short. To make it easier for Bod to live among the ghosts, ghouls, and the undead, he is given “the Freedom of the Graveyard.” This gives him a myriad of semi-special powers, including “fading” from notice, spooking people, and walking through mausoleum walls. Under the guidance of his parents and watchful guardian, Silas, Bod learns the ways of the dead. Growing up, Bod was forbidden from leaving the graveyard. That, however, doesn’t stop the curious kid from getting into various scrapes. While exploring the graveyard thoroughly, Bod meets a number of colorful and creepy characters, including the slithering Sleer (protectors of an ancient grave), vile ghouls, a witch named Liza, and his first human friend, Scarlett. Despite the many adventures offered by the forgotten graveyard, the lure of the outside world becomes too great. There, an all-too-real danger exists. Outside the graveyard gates, his family’s killer awaits. Jack’s been waiting a long time to find and finish Nobody Owens, and Bod just might give the man Jack the opportunity to do just that. Channeling the Rudyard Kipling classic, The Jungle Book, this novel is a delightful adventure that comes with a handful of scares and surprising moments that will tug on the toughest heartstrings. With Gaiman’s stellar writing, intriguing characters, and well-executed plot, it’s no wonder why The Graveyard Book is lauded by fans and critics alike. This is a definite must-read for children, adults, and all the in-betweeners. Note: The Graveyard Book has won a number of awards including the 2009 Locus Award for Best Young Adult Book, 2009 Hugo Award for Best Novel, a Newberry Medal, and a 2010 Carnegie Medal. Neil Gaiman is a good friend of mine’s favorite writer, so I might have to check this out. My favorite writer would definitely have to be Carol Goodman, and I’d say start with the Drowning Tree or the Lake of Dead Languages, both fantastic books! I’ve always wanted to try a Gaiman. I’ve heard so much about them, but never knew where to start. Is this your favorite, or would you choose another as a “first read” for the author? Well, it really depends on what you’re looking for. The Graveyard Book is a good starter if you like a bit of mystery and a hint of horror. But if you want something that’s more “adult”, then American Gods or Anansi Boys. I haven’t read “Good Omens” but I heard that that’s the thing you go for if you want a bit of humor. 🙂 Thanks for dropping by and let me know how your Gaiman-reading goes! Kristel! I read this book last Christmas and I loved it too! There are some readers who disliked the opening paragraphs, but that’s my favorite part. I miss you, let’s see each other soon! Your reviews are amazingly detailed! I hope you don’t mind but I might use some of your ideas to improve my own reviews!